My friend Jodi who is the most awesome hairdresser ever, loves to garden like I do. Today she updated my coif and we happily chatted about plants and more plants. She asked me what my favorite plants in my garden are. Hard to say, I have so many favorites. 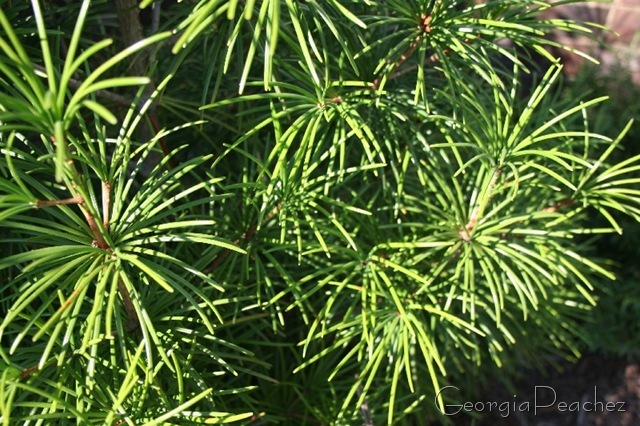 But ranking pretty high on the list is my umbrella pine. I also have a love affair with standards or topiaries. I have tended this sweet myrtle standard for over 10 years. On year a huge chunk of it died and for a couple of years after that until it recovered and filled in again in was known as the death star. New to the garden this year is this rosemary standard with 3 balls of branches. 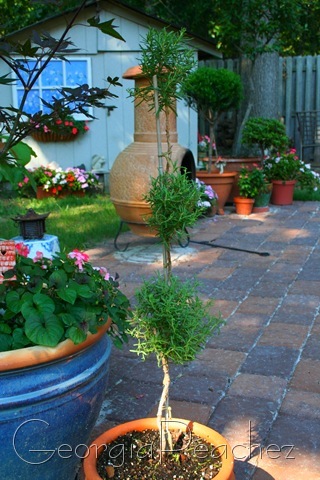 Rosemary is a great plant for training into a standard, as is sweet myrtle. We lost a large tree in our yard just a few weeks ago. It just up and kicked the bucket. It sat in a corner of my yard behind a piece of brick serpentine fence. It shaded the entire corner. Underneath it on top of the fence I have five gorgeous concrete planters that were full with impatients. Well, now that corner is in full sun, no shade in sight. So I pulled out the impatients and replanted them with zebra grass and pentas, both of which love full sun. I’m hoping the height of the zebra grass will give a little privacy until we can get a new tree planted. A BIG tree. 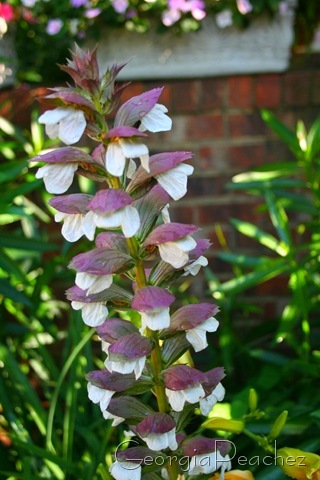 Planted in front of this brick wall/fence is another of my favorite perennials, bear’s breech. 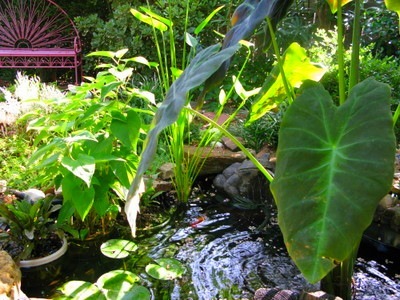 Doesn’t that bench look like a wonderful place to sit and enjoy her pretty pond! Well, something else that is an absolute favorite is going to visit my BFF Beth up in Falls Church, VA. I’m headed that way on Friday because we are going together to the BIG FLEA this weekend! Woooohoooo! 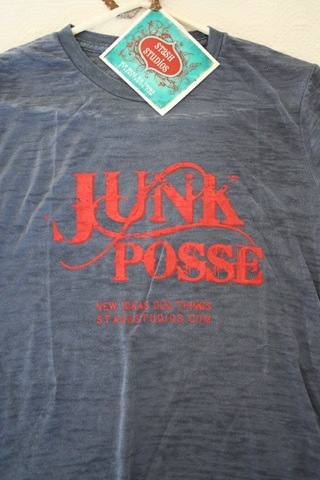 I’ve got my Junk Posse T-Shirt all ready packed to go. I consider myself the Mid-Atlantic chapter President and if you want to join in check out Cheryl’s blog for all the info. While you are over there it’s an absolute must to check out REFUELED, the online magazine about everything crusty and cool for which she is the Features Editor and contributor. Beth and I are hoping to find some awesome treasures, something that we can use in our creations and for inspirations. But I have to tell you, no one scores more prolifically than Niki when she goes to the flea markets in and around Bath, England. Just go check out her latest flea bag scores and drool. While she is out finding vintage ribbons, velvets, porcelain, millinery etc. 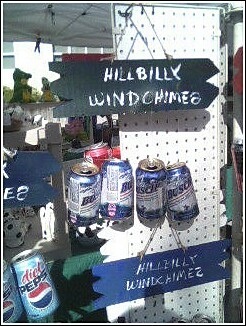 at the sales around here we have something called hillbilly (redneck) windchimes. There I was a-looking at your colorful garden. Thinking that I was going to say, “Oh Suzy, you know you’re gonna have lots of hummers with those pentas.” When then I see my own little spot of heaven! I thank you. It was a surprise! What an amazing garden! 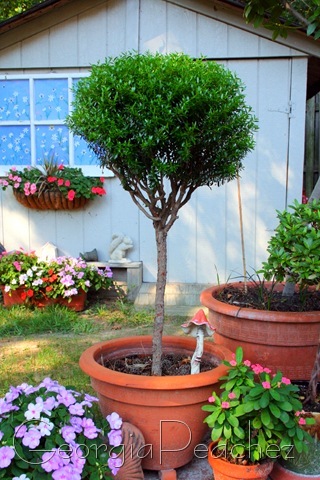 I am all about topiaries too. Rosemary is the best-anything you can eat is always a favorite! 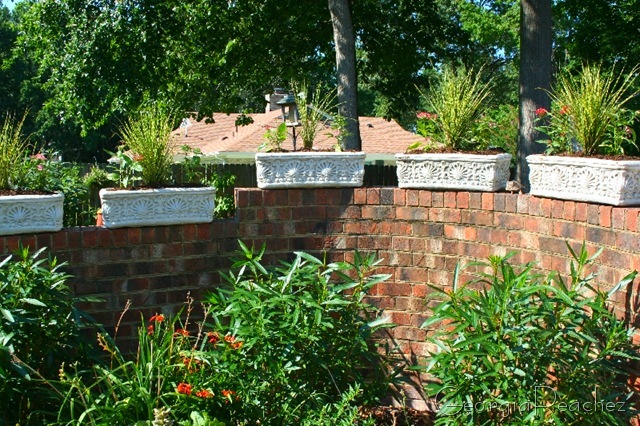 Wow, you have a gorgeous garden, lots of pretty plants. I did have a few nice plants until about a day ago when 5 little puppies got in and decided to shred a few things 🙂 But boy did they have fun (according to my kids). Oh, I am excited, I am going to the DC Big Flea too. I went back in February to the one they had in Fredericksburg and came home with LOTS of goodies! Wow, thanks dear! You’ll have to keep an eye out for my friend Sue of Vintage Rescue. She’s in the tee posse too and she’ll be at the BF! And as for those chimes, well, I guess we could stretch it – new idea for an old thing? Naaah. looks like my neighbours shop in your hillbilly shack… that’s about their speed….sigh…. Hope you have fun junkin! We have practically no more fleas down here in Fl anymore. Price of gas is keeping the best dealers away…poo! You have an amazing garden! Very beautiful! Have fun treasure hunting! I so have to join the posse! Love your name by the way… I’m a Georgia Peach by birth! fun blog! I’ll soooo have to come back and visit! Great t-shirt. Have a great time with beth at the flea market! I hope you blog about your yummy scores!